Live in an intentional multifaith residential community, study nonviolence and faith-based community organizing, plant and tend CLT* gardens, enjoy hiking, kayaking, drumming, ropes course, big puppet making and good food. Interns will co-create their time together with elders from each tradition and will support CLT’s* Multifaith Family Peace Camp at Stony Point Center, July 25-31. If you are interested, please contact MPF Director Rabia Terri Harris: rabia@MPFweb.org or Rabbi Lynn Gottlieb at lgottlieb@stonypointcenter.org. Interns will receive a $300 stipend and room and board. They are responsible for their own travel to and from Stony Point Center. 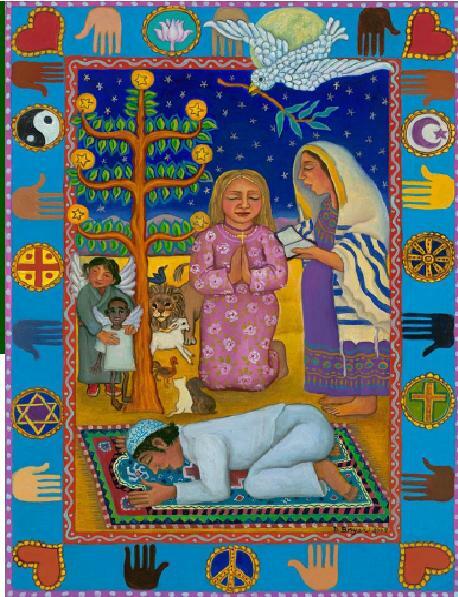 *Sponsored by the Community of Living Traditions: an intentional multifaith residential community at Stony Point Center dedicated to the study and practice of nonviolence. ← Words of Witness in DC May 16 – be there!